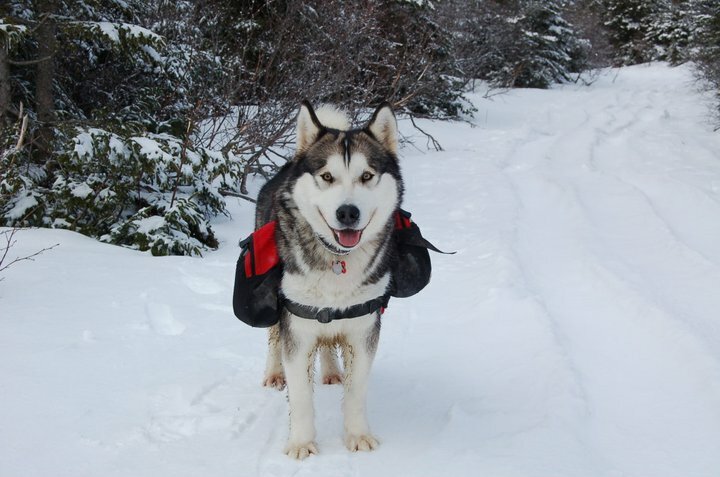 Prior to the development of the Alaskan Malamute as a registered breed, 'backpacking' served a necessary working function for dogs. These days, packing and hiking with your Alaskan Malamute can be a fun way to spend an afternoon, a weekend - or even a week. Planning and preparation is a key element for both you and your dog to be able to enjoy the experience. Loading an out-of-shape or inexperienced dog with dozens of pounds has the potential to not only ruin the experience but to hurt the dog. While there are some organized hiking excursions that welcome dogs, many events, places - and people - do not consider a furry companion welcome. Once you finally do get the pack on the dog (assuming he doesn't crawl out of it or eat parts of it off) you should probably begin with 10 per cent of his body weight for a few weeks, moving up a few extra pounds each week. If you are going to go packing with your dog, walk the trail (or roadside) first without the pack, particularly if the area is new to you. That gives you an idea of 'loose' dogs (or other animals) to watch out for, how much human traffic uses the trail, if there is snow machines, All-terrain Vehicles or bikes on the trail, if there are children using it, and just how well your dog does on the walk. You will need to buy a $30 - $40 backpack for your dog. You will need to bring clean water, food or treats, a towel, and a small first aid kit, as the barest minimum of supplies. You are more likely to need the first aid kit (stings, scratches, cuts, indigestion from eating 'wild berries' along the trail) than your dog, but your dog may end up needing something from it, too. In Canada, we are fortunate enough to have dozens of trails for public use – with dogs. Asking at your local municipal office will set you in the right direction. As well, if you contact the AMCC, we likely have a member in many regions of the country who would enjoy teaching you the art, and science, of packing with your dog and would be happy to assess your dogs condition and get you started. Working certificates are offered for backpacking through either Canadian Rescue or the American Alaskan Malamute Club.